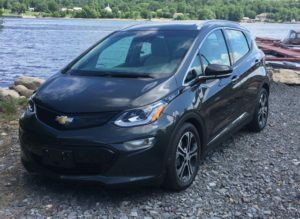 In late summer, I test drove the all-electric 2017 Chevy Bolt EV. 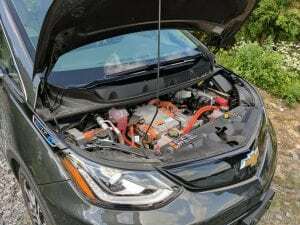 The Bolt is not to be confused with the similar-sounding Chevy Volt, which uses a gas-powered generator to recharge the battery. The Bolt doesn’t look like George Jetson should own it. Classified as a crossover, it’s a nicely-designed compact hatchback – without a front grill or exhaust pipe. 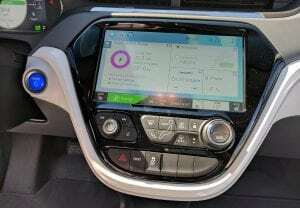 It’s very quiet because, unlike hybrids that require both battery power and fossil fuel to operate, the Bolt EV has no gas engine. Beyond the fact that it’s an electric car, there’s some pretty funky and significant technology employed. The front-wheel-drive Bolt runs off an automatic electric one-speed motor propulsion system that puts out 200 horsepower (hp). That’s almost double that of the Nissan Leaf and 30 hp more than the BMW i3. It runs off a massive battery, an all-new 435-kg, 288-cell, 60-kWh lithium-ion pack that gets up to 383 km on a full charge. It’s spacious inside, with good headroom. The centre display console bulges out from the centre of the dash, almost appearing to float. The floor is almost flat because, unlike traditional cars, no mechanical linkage, massive cables or wiring harnesses take up valuable space. The electronic shifter operates somewhat like a gaming joystick. When you shift, instead of throwing gears, a signal is sent to the transmission. The shift takes little effort and it’s silent to boot. You also get more room because the batteries are fairly flat and positioned under the car. And the fairly large windows provide a great field of view. Our 250-km-plus test drive took us along winding roads from Montreal’s West Island to the Ontario border, north into the Laurentians, followed by a highway jaunt back to home base. Two of us shared a car, so we each had an opportunity to drive and play. The engine started instantly, with no need to warm it to get the oil level up. When we hit the open road, I hit the accelerator and – much to my surprise – it really took off. It can do 0 to 96 km/h in 6.5 seconds. Passing cars was extremely easy and the car manoeuvred nicely, holding the road even on the winding back roads. How will they hold up in extreme temperatures (remembering how often I’ve had to jump-start my car at -40C)? How quickly and easily could they be recharged? The battery, co-developed with LG Chem and LG Electronics, is thermally controlled and liquid-cooled to keep the cells operating in top form. 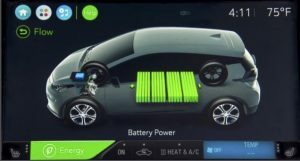 Individual cells can be replaced, but the battery pack is warrantied for eight years and 160,000 km, and further guaranteed to still have 65 per cent capacity remaining at the end of the warranty period. Unlike the Volt, there’s no gas backup to recharge on the fly but you do have choices. There are three charging levels available so you won’t find yourself out of power on the side of the road. Level 1 is your basic home charging system but also the slowest. It uses an included 110V cord set. For each hour of charge, you can expect about six to 6.5 km of driving. At these rates, a full recharge would take you more than four days. Level 2 offers faster home charging; at 240V it’s much like your clothes dryer. With this optional accessory, you can get up to 40 km of driving per hour of charge. A full recharge from empty would take about 9.5 hours. You can also schedule this recharge through the car’s touchscreen. As batteries age, recharge times will increase and the cells’ maximum capacities will decline. Without recharging and no room for a 435-kg spare battery, you can only make it so far on a single charge. That distance is also reduced if you’re charging your phone, or using accessories like your infotainment console and windshield wipers. And cranking the air conditioning in summer and the heater in winter will take power. So a lot of research and development went into ways to conserve and generate power. For example, the motor doubles as a generator, capturing kinetic energy and turning it into electrical energy, which then is sent back to the battery. This regenerating braking happens whenever you coast, decelerate or hit the brake. And then there’s the Regen on Demand system: a little paddle behind the steering wheel allows you to slow the car and engage regenerative braking. One-Pedal driving is another very cool feature. In Low Mode, your car operates almost like a mega-powered golf-cart. Push the pedal and the car moves; take your foot off and the car stops. Of course, you wouldn’t want to do that going 100 km/h. To slow down quickly, you can still use the brake. At first, one-pedal driving seemed foreign. But it’s actually quite easy and I became obsessed with how much energy I was saving, gazing constantly at the console display indicating whether energy was being consumed or regenerated. Bolt has an eight-inch digital display gauge cluster, which you can configure in three colours and three themes: Classic, Modern and Enhanced. 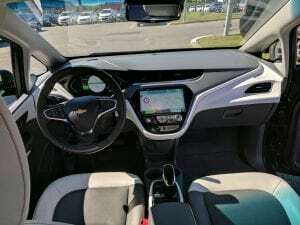 In addition to speed and distance, you’ll get a plethora of information, particularly the all-important battery charge level and range estimate. Of course, that changes with energy use, speed and how much you can regenerate. You also get an indication of whether power is going to the battery, something I found myself constantly monitoring. The centre console has a highly configurable 10.2-inch colour touch-screen for infotainment. You control and configure your 4G LTE, Android Auto or Apple Car Play, Bluetooth, mobile Wi-Fi, voice commands, USB ports and auxiliary jack. It too provides a plethora of information, complete with graphs and charts giving you more info than you can probably take in or need to know. It offers details like consumption history and energy efficiency broken down in five-km intervals. There’s also a breakdown on energy usage by function – i.e. driving, climate controls, energy use based on your driving habits, climate settings and even outdoor conditions. 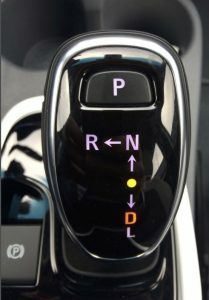 Also notable is the electronic parking brake. A simple touch of a button replaces the manual process. It even turn on if it senses the car is parked on a steep incline. Another very cool feature is the rear-view mirror, which becomes a rear vision camera with the flick of a finger. It offers a wide point-of-view so you can avoid blind spots and really see what’s behind you, not just the headrests of the back seats. And an optional surround vision four-camera system has a 360-degree bird’s-eye view, ideal for getting in and out of tight parking spots. It even has four Michelin self-sealing tires. They contain a chemical that can seal a puncture in the tread. Overall, I was fairly impressed. It’s a small car but doesn’t feel small. It’s stylish and smart – about what you’d expect in a compact vehicle. It’s certainly not luxurious like the (significantly pricier) Tesla S.
Some people would buy this vehicle for its awesome technology, others might buy it to keep the planet green. But I assume most would do it to save operating cash, particularly where gas prices are very high. It’s estimated it would cost a quarter of what it would to drive a gas-powered vehicle. I would also expect there would be less maintenance, as there’s no oil or spark plugs to change, or pistons and seals to worry about. There is of course the higher price of entry and the limited number of charging stations in some areas – although that’s growing. 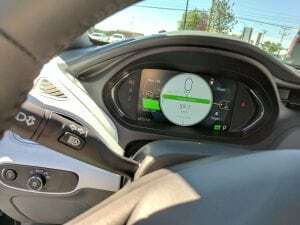 While I was blown away by the way it drove, the battery-life and the technological advances it included, there were a few things that surprised me. You can’t get a sunroof or a navigation system. The latter I suspect would be to keep the price down and reduce power usage. I was also surprised that although there’s an option for heated seats, seats must be adjusted manually. I’d would like to see an all-wheel drive option, although this would likely require a second motor and greater battery range. There are two models (LT & Premier) and nine combinations. 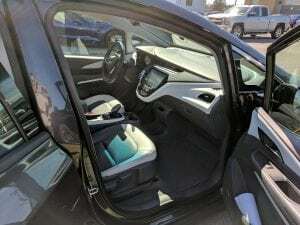 The manufacturer’s suggested retail price on Bolt EV LT with freight and tax is $44,795; the Premier is $49,795 (that’s the model we drove). Three provinces offer hefty tax incentives: B.C. ($5,600), Quebec ($8,000) and Ontario ($14,000), making the Bolt even more appealing there. 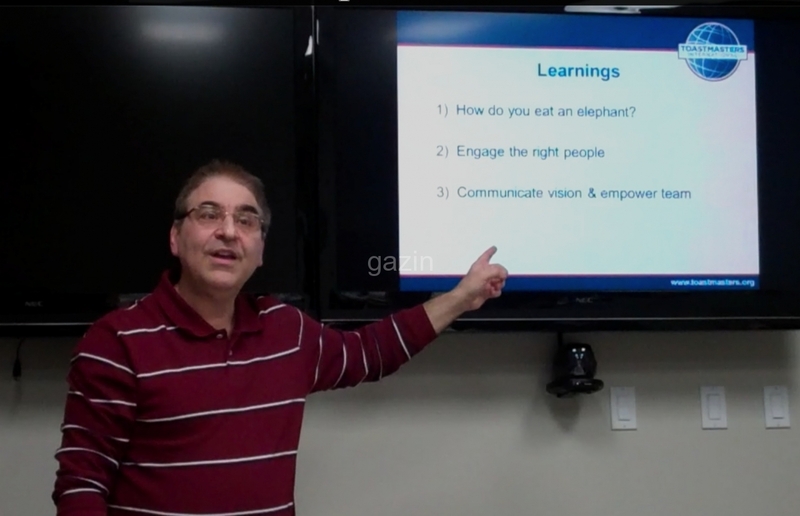 Greg Gazin, also known as The Gadget Guy and Gadget Greg, is a syndicated veteran tech columnist, small business and technology speaker, blogger, podcaster and author. Reach him @gadgetgreg or at GadgetGuy.ca. Photos by Greg Gazin. Illustrations courtesy Chevrolet. This article was also published by Troy Media.